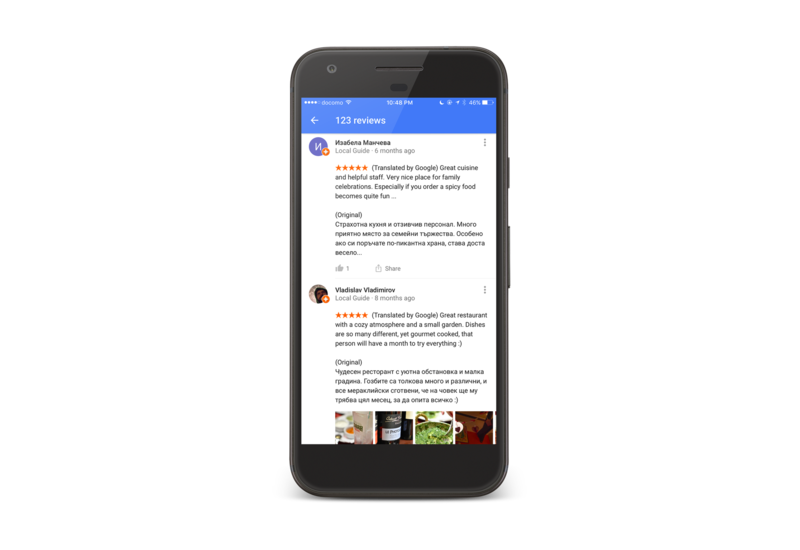 Google’s local reviews has undergone a rather small, but very notable change. Moving forward, Google says it will take the reviews and automatically translate them into what your native language is. Let’s say you’re in a foreign country and you’re looking for a place to eat. When you search for restaurants near you in Italy, the reviews that were typed in Italian, let’s say, will translate automatically to what the language on your phone is set to. For iPhone users, this can be remembered when you first got your phone and it booted up, said hello in many different languages, you swiped and chose your language. So there is nothing extra for you to do now. This change will happen automatically, says Google, when you are searching in the Google Search app or in Google Maps. From the looks of it, it does not look like the update will roll out over Desktop search or Mobile Browser search, only within the apps stated above. So how do you start seeing these translated reviews? Simply update your apps for Google Search and/or Google Maps to the latest versions, and you’re all set!To start seeing translated reviews as pictured above, make sure your Google Maps and Search apps are updated to the latest versions. We hope this helps during your travels, and as always, if you ever have any questions for translation services, please don’t hesitate to contact us.